A quick translation. Adapted (with help!) from the Babelish*. . . Original German text from Heise Online New-Ticker. 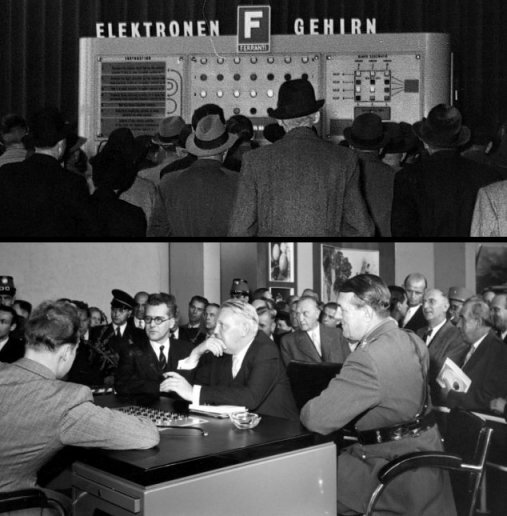 On 6 October 1951 an electronic computer operated for the first time on German soil. For three weeks, the "Nimrod" from the English company Ferranti was the star of the Berlin Industrial Show. The Nimrod was not a universally programmable computer, but a special machine with 480 vacuum tubes that played Nim [German text]. Nimrod had been originally built by Ferranti for the Festival of Britain in London. At the end of the Festival the "electronic brain" was flown at short notice to the industrial show on the Charlottenburg fairground and set up in the British pavilion. There visitors played against the computer, with usually no chance of winning, if they did not understand the logic of Nim. One of those trying it on opening day, 6 October 1951, was the Federal Minister for Economic Affairs at that time Ludwig Erhard, who lost three times in three games. Federal Chancellor Konrad Adenauer, who was likewise present at the inauguration, did not play: Top Minister against electronic brain... inconceivable! During its three week stay in Germany Nimrod was surrounded by visitors all the time, and had to be guarded constantly by a number of security police who patrolled the queues. In the British pavilion alongside Nimrod there was a traditional English bar which poured free beverages. To the astonishment of the Englishmen the beer hardly received any attention. Nimrod can be considered as the first electronic computer to arrive in Germany, because it operated with tubes and executed its program quasi-independently. The older Zuse machines Z3 and Z4 had only relays, and a tube multiplying unit built in 1949 by Walter Sprick, which is located today in the German museum, was only a module added to a punch card machine. The first universal electronic calculator in Germany was probably the G1 at the University of Goettingen, which entered service at the end of 1952. The functioning of Nimrod can be explored with a simulator, which is, however, only available for BeOS. The model for Nimrod was the Nimatron, a "computing robot" that played Nim, which was designed by Westinghouse for the 1939 World Exhibition in New York. This world exhibition, which gave Walt Disney the idea for his Disneyland, is still considered today as the most progressive of its type. The Nimatron was presented as the sort of computational aid that would [in the future] be at the service of the "average 'Middleton' family". Each visitor who played against the Nimatron got a stick-on button "I have seen the Future". The computer scientist David Gelernter, the 1994/95 victim of an Unabomber assassination attempt, wrote "1939: The Lost World of the Fair" a remarkable 'fact novel' about the world exhibition, which mentions the Nimatron: "it was a computational domestic help, which appealed to an America that still believed in its dreams. But then the war came." Nimrod, its improved British descendant, was named more darkly. Ferranti's choice of the reference to Nimrod, the builder of Babylon, was intentional, to separate the "game computer" from the "real one": the Mark 1, which was produced by the firm at the same time. Nimrod however stole the show from the Mark 1, and so is the first example of the now well known product diversification in the computer industry. The game that introduced electronic computers in Germany was already well known. Nim was introduced - with its solution - in the year 1902 by the Harvard mathematician Charles Bouton. Bouton modified an old Chinese game named Fan Tan to his own specification and baptized it with the Germanic name Nim [in German meaning "takes!"]. Bouton, who wanted to use the game to demonstrate the advantage of the binary number system, found a simple (binary) formula, with which, from the state of play, players can determine correct moves immediately. In the same year the German mathematician Paul Ahrens, in the "Scientific Weekly Review", proved that the [supposed] relation to Fan Tan is simply nonsense. *"Babelish" — the tortured prose produced by the "BabelFish(TM)" translator. • Thanks to Andre Przywara and Bert Freudenberg for completing the translation — supplying the bits where Babelfish left me floundering, and correcting my misapprehensions. • I have not found the original (English) source for the quotation from the Gelernter novel, so the double translation has probably distorted it out of recognition! Revision Feb 2011: I finally tracked down the book in the campus library, and I can find no reference there to the Nimatron! So I think there's a lot of creative licence in that paragraph!